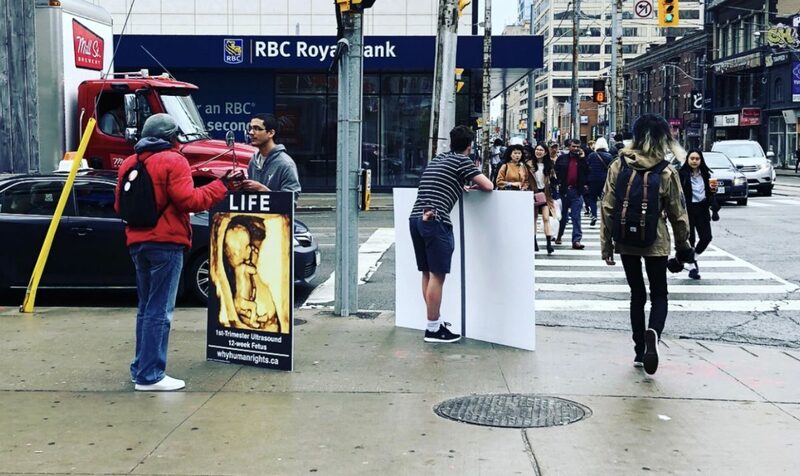 On dreary, rainy days, it can be hard to find the motivation to get out on the streets and engage people on the topic of abortion. When the weather is gloomy and gray, it feels like it casts a shadow on the day, and sets the mood for conversations about an already heavy topic, to also be heavy, and more difficult to “see the light”, as it were. The weather really can have an affect on our moods and motivation. He then said he agreed with abortion, because fetuses lack consciousness and can’t respond to stimulus until birth, which he thinks is necessary to have the right to life. We spoke about how fetuses do in fact respond to stimulus in the womb, and can feel pain about halfway through a pregnancy, but newborns don’t even have consciousness in the way he means, and he agreed newborns have the right to life. We discussed other scientific facts about prenatal development, and he admitted he wasn’t aware of anything I told him, or much about the topic at all. He then said abortion is acceptable because if placed for adoption, the child may grow up in an unloving home. I pointed out to him that there are many approved couples who are waiting to adopt a baby in Canada, but the waitlist is very long. I asked if he knew anybody who has adopted. I wanted to point out that odds are, they adopted a baby from outside of Canada for this very reason. He thought I meant does he know anybody who is adopted. He said his mother was adopted and was really messed up by it, because she grew up in a home without love. At this point the arrogance disappeared in an instant, and he started to cry, and was really shaken. I said, “I am sorry to hear that, and I know that adoption isn’t perfect, and is emotional for everyone involved… can I ask you something?” He wiped his face and shook his head yes. “Do you love your mother?” I asked. “Yes,” he said. “And does she know it?” He paused for a moment. “Yes,” he said. He said he himself planned to adopt one day instead of having biological children. I said, “So you see the good in giving someone a chance at life.” He said yes, and that he had to go, with none of the arrogance and hostility that were present at the start of our conversation. I thanked him for talking to me and he walked away. It is human nature to dwell on the negatives, and sometimes even forget about the positives, so I understand and empathize with this young man for initially seeing only his mother’s suffering as a result of being adopted. It was a powerful and emotional experience for both of us as he came to realize that he himself was the remedy to that suffering. He may or may not have changed his opinion about abortion following our conversation, I’ll never know. But he definitely had a change of heart, and as my friend Maria says, “Once the heart is changed, the head is the easy part to flip, it is much harder the other way around.” Once a person realizes that even when a person has suffered greatly, that love makes it all worthwhile, they have changed their perspective, and that’s a great start. And that makes a gloomy, grey day, feel all the brighter.